Peterson's Admonition: When you think you're going down for the third time -- just remember that you may have counted wrong. This story begins where it has ended, with me in New York City cheerily, albeit weary and fighting a ugly head cold (more on that later), clicking away at the keyboard of this fine laptop provided by my employer (assuming “fine” includes the fact it doesn’t recognize the power cable half the time and looses track of the touchpad, thus requiring a reboot) at 2+ AM in the Belvedere hotel. Belvedere, by the way, is French for “Not the hotel booked by Corporate Travel for Greg”, just so you know. I’ve only been here a half hour, but so far this place is GREAT! I had been booked to stay at the Hilton Garden Inn. The week before I had been put up at the Novotel, which is a bit of a dive in a Euro sort of way, so I figured the Hilton had to be better. While the staff was friendly and helpful, the accommodations were lacking. Arriving so late, my options were for a non-smoking room with two queen sized beds or a smoking room with a king sized bed. (Sidebar: Walking this planet with a 6’5″ frame means there is no such thing as a “king” sized bed. There are either “regular” sized beds, small beds, really damn uncomfortably small beds and cribs. When I travel, my best shot at any thing resembling a decent night sleep is a “king” sized bed.) Ah, but non-smoking trumps king sized bed so I took the non-smoking room. Ready to turn in, I slipped the door key card into the slot and pushed the door open. Wild horses will not pull out of me what I saw. Let’s just say the room wasn’t available and that it was VERY much in use. What fun to be the scary stranger in the doorway at 1:00 AM. Thanks, Hilton! The front desk agent was very apologetic and comped me free breakfasts for my stay (I don’t eat breakfast.) That left the smoking king. Ugh. Thinking (or not thinking very well, as it turns out) this head cold would block out the smoke smell, I took the room. After all, it’s New York City and it’s pushing 1:00 AM. What are my options? Well, the entire floor stunk. The room really stunk and when I pulled back the covers, I looked around to see who it was that was standing behind me that just lit up a cigarette. The stench of cigarette smoke permeated everything and if I didn’t get out of there fast, my clothes and my person would stink of smoke for the duration of my stay. The collection of Good Ideas generally doesn’t include reeking of smoke in business meetings involving Ogilvy in the heart of New York City. Well, at least I was thinking again. So back down to the desk to press for better options. The desk clerk called around to a couple of hotels and sent me over to the Belvedere. Did I mention this place is GREAT? It’s 100% non-smoking. And check this out, the soap is from England! 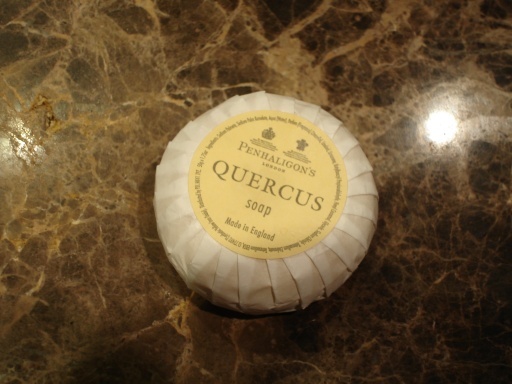 Penhaligon’s Quercus soap. OooooOOOOooOoooo. Fancy! Novotel just had a cake of stuff in shrink wrap labeled “soap.” I kid you not. So it’s better at the moment, but this head cold is in the Noseagra Falls stage. I packed something like 8 handkerchiefs to deal with it over the next two days. I can thank being sealed in an aluminum can for 4+ hours last Friday as I flew home from New York City. The guy across the aisle was constantly sneezing and sniffling (like me now) and had a penchant for not covering his face when aerosolizing his wretched illness. But I feel his pain now. There’s nothing quite like a head cold across altitude shifts from 5,000 feet to 36,000 feet to 200 feet to really make one ponder the science of hydraulics. I love road warrior stories, especially when they happen to someone else. Well, time to find a pillow. I have to wake up and be charming in six hours. Coolness. They even have a bath robe for me here. Too bad it’s for a guy about 18 inches shorter across the shoulders than I.